Meghna Group of Industries. job circular 2019 has been published. It’s a huge and attractive job circular. Meghna group is one of the largest industries of Bangladesh. Many people have been unemployed in this country and they can not get their desired job circular. In this case, Meghna group has been created a great chance for unemployed people. To get Meghna group job circular 2019 related all information, you can visit our site that is jobs.lekhaporabd.com. The history Meghna group of industries dates back to 1976. MGI has been very aggressive in its expansion plan & emerged as the largest investor in the industrial development of Bangladesh. This is undoubtedly a glaring example of passionate initiative and pioneering leadership role by a private sector investor in countries economic and industrial development. So, anyone can take this opportunity to apply for this job. If you want to apply for this job, you should submit your application within short time. Meghna group job circular 2019 has been converted to an image file so that everyone can read easily or download this job circular. 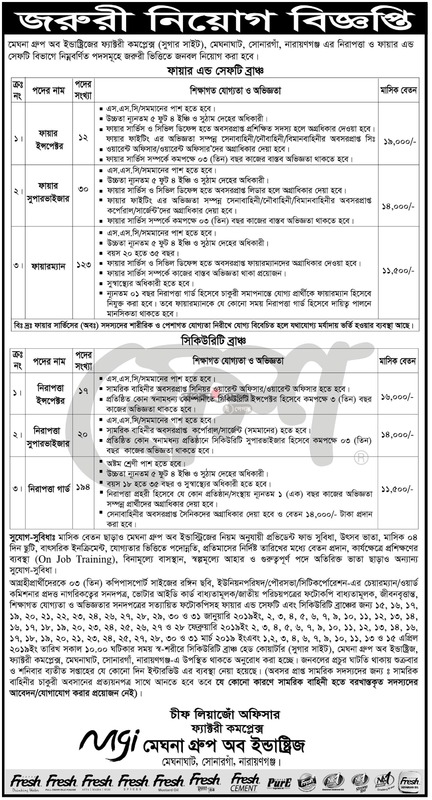 Meghna group job circular 2019 has been given below.